Teenage Bedroom is a sun kissed violet based polish with a vibrant linear holographic rainbow! Dave from Ocotopus Party Nail Lacquer told me about the inspiration for the polish, and I must say it is quite well thought out and well, I got a bit nostalgic while reading his description. I wanted to create a collection that was loud and vibrant, so things like tropical paradises, heat waves, guns, Barbie dolls, and gemstones all made it into the mix. Teenage bedroom is sort of an ode to youth. Teenagers spend a lot of formative hours in their rooms dreaming of the future, mulling over the past, obsessing over music, crushes, movies, food, friends, and nail polish. Their room acts sort of as both a catalyst and a sanctuary at that time in life. The color is a warmer toned purple to lend itself both to the summer season and the safety and urgency of such a sacred place in our lives. I wore two coats and topcoat for the photos below. The formula was perfectly smooth and easy to apply, very little cleanup needed. Afterward, I did some Octopus inspired stamping over it with XL plate U and MDU #14 stamping polish. 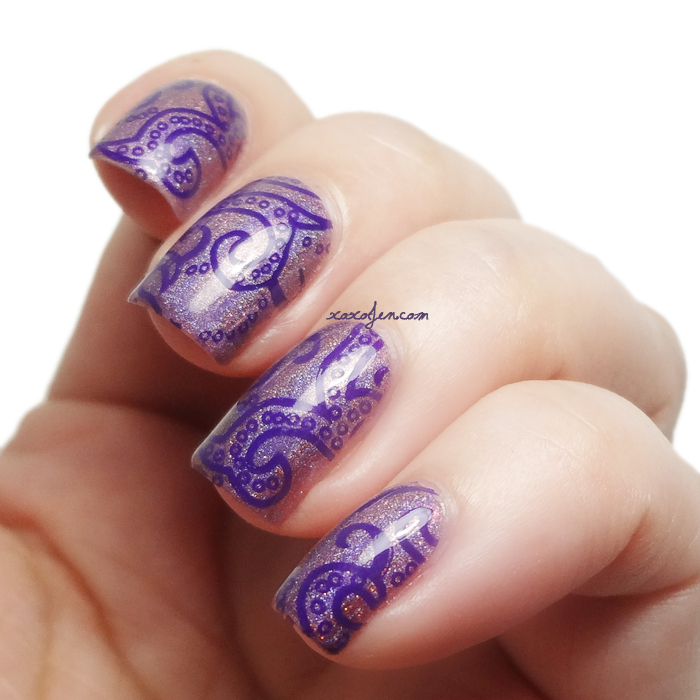 I used a super squishy marshmallow stamper from Chelle Lee. 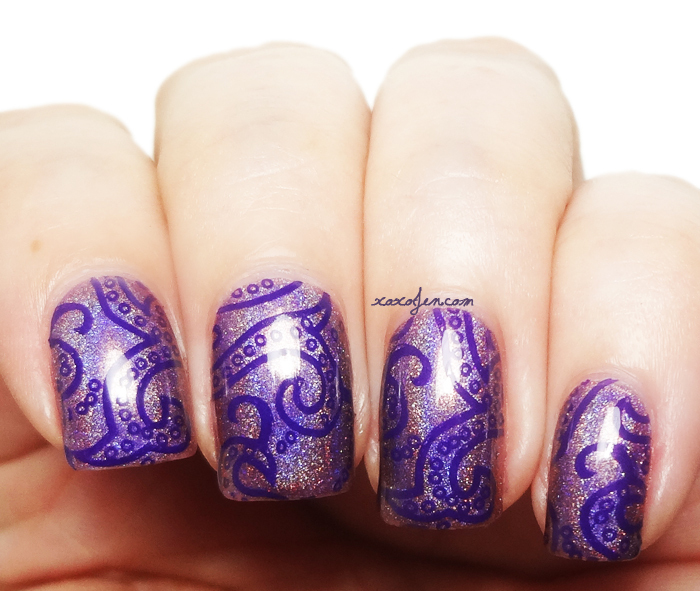 I hope you've enjoyed seeing this pretty purple polish! The entire summer collection consists of eight different polishes. Other bloggers will be posting those from now until launch, so keep a look out for them! You can get this polish and other beauties on May 30th at noon central on the OPNL shop! Gorgeous holo and the stamping on top looks awesome too.